When we begin our genealogy research journey we are instructed to start with information about ourselves and work backward. Starting with yourself is easy considering you are the expert of your life. Tracing the next generation or two may also be easier with the use of documents and photos found in your home. In fact, home sources are one of the first sources you should look for in your research pursuit. There are many items in your home that can help with your family history research. For some good ideas, look at this handy checklist published by Brigham Young University. What Is a Home Source? A home source is simply an item that has genealogical value that is stored in your home or a family member’s home. A few examples of home sources include immigration papers, yearbooks, newspaper clippings, and land deeds. But a home source can be much more than a document listing a name, date, or place. Home sources are a hit-or-miss proposition. It’s easy to dismiss home sources as something you don’t have in your possession, or to assume items that have been passed down in the family are not genealogically rich. For example, I haven’t inherited any diaries, scrapbooks, or documents – but one day while I was cleaning I came across an air mail letter and envelope that my maternal grandmother had sent me, when I was a child, for my stamp collection. That envelope/letter was one she received in response to a genealogical look-up she requested of a UK researcher. This long-forgotten item ended up being much more important to my genealogy than its original intention. So, the lesson here is to take your time studying items you may have inherited from your family; there might be more treasures in your home than you realize. What’s the Value of a Home Source? What’s the value of a home source versus a record or document you find via a website, library, or archive? Well it depends – but at the very least, a home source provides you with information, and in some cases, it provides clues not found elsewhere. Remember: documents aren’t the only source for family information. Case in point is a family heirloom I’ve inherited, a painted china bowl. Photo: china bowl. Credit: Gena Philibert-Ortega. Photo: back of a china bowl. Credit: Gena Philibert-Ortega. 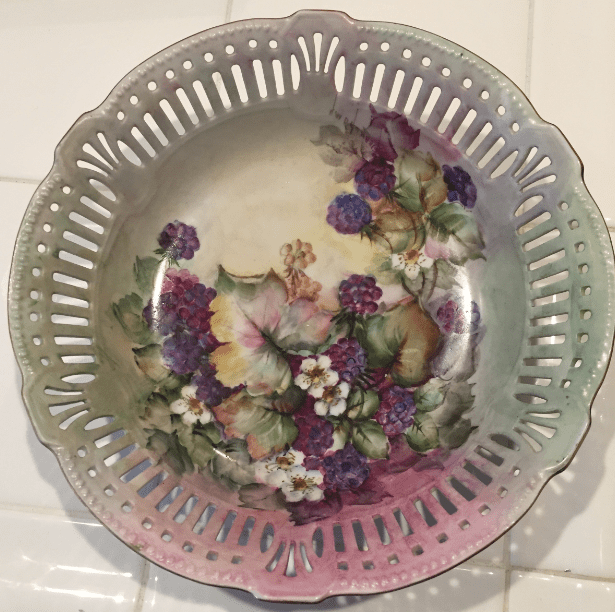 So, this one bowl appears at first to be purely decorative, but actually provides my great-grandparents’ wedding date and a mention of their 50th wedding anniversary. 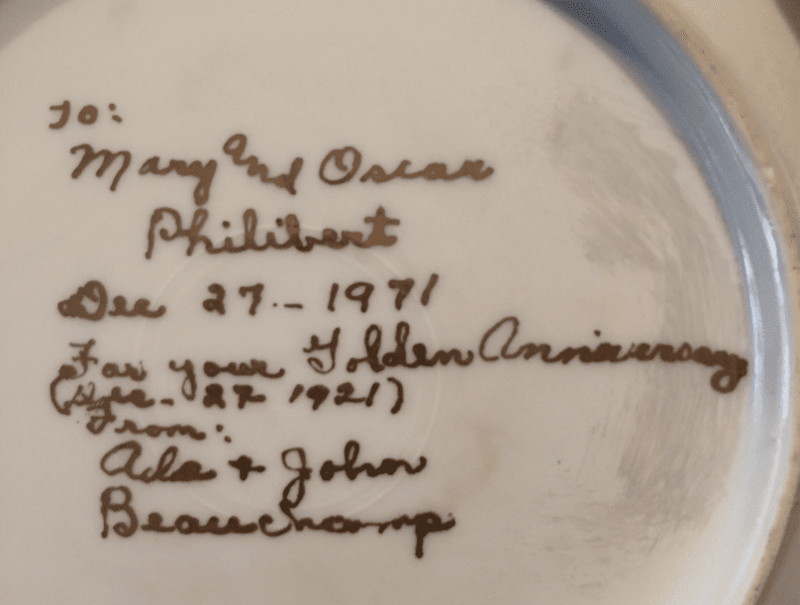 From this information, I can search for a marriage license or certificate, and perhaps even newspaper articles documenting their engagement, wedding, and 25th & 50th anniversaries. Another item I own that may seem unremarkable is an elementary school math text book that was once owned by my paternal grandmother. In it, she lists her surname as that of her mother’s second husband, giving me a clue to when they were married and what additional surname to use when searching for her. Probably the most difficult part of using home sources is finding what home they reside in. I understand you may not have inherited much from your family. So, make sure to get the word of your interest in family history out to family members. Ask them for information that might be found on the heirlooms they inherited. Then leave a trail in cyberspace so that other unknown-to-you family members can find you and share what they have/know. That signature quilt inherited by your paternal cousin might lead to a marriage date or family connection not known previously. Make it easier for family members with genealogically relevant items to find you. Leave a family history trail by posting to your own family history blog or website. Be active on social media channels like Facebook or Twitter. Post information online about the family you are researching so that when a potential cousin Googles that ancestor’s name, they will find you. The search for home sources is ongoing. It’s imperative to keep your eyes open for that one source that may one day answer your toughest brick wall question.